1. 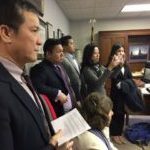 What can the Virginia Asian Chamber do for me that other Chambers cannot do? The Virginia Asian Chamber works closely with other 60+ mainstream Virginia Chambers to help make your positions known to Virginia legislators. 2. Why should I join the Virginia Asian Chamber? What is the bottom line? Advertizes your company on our webpage which collectively reach thousands of members and contacts.